KGR Institute of Technology and Management was sponsored by KESA Society. Founder & Chairman of the Society Sri Lion K.Govind Reddy.B.Tech; MBA; PGDM is an Industrialist with two decades of experience. 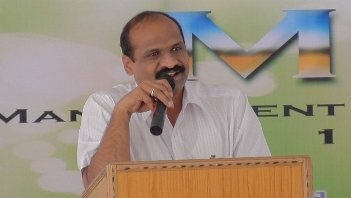 Recognizing the need of young and dynamic managers in the fast changing corporate landscape, Sri K.Govind Reddy is actively associated with management and technical education for the last 15 years. KGR ITM was established in the year 2008-09 at Rampally (V), Keesara (M) around 7 km from ECIL 'X' Roads, Hyderabad with an objective of grooming young IT engineers & managers with enhanced personality traits and value based leadership qualities. Vision of KGR ITM is to Impart Quality Professional Education with Industry Interface and to develop Value Based Leadership qualities, personality traits and Social Responsibility. Mission of KGR ITM is to create the thought process that deepen and advance our understanding of management and nurture committed and thoughtful leaders who change the corporate world. We are making a humble attempt to create a better tomorrow by imparting quality professional education with Industry Interface. We believe that student life should make a positive difference and the master's program should provide opportunity to build competency in the individual to face the challenges in professional career. Our class room teaching provide the necessary foundation in subject related knowledge and out of the class room activities facilitate the individual to develop Value Based Leadership qualities, personality traits and Social Responsibility. 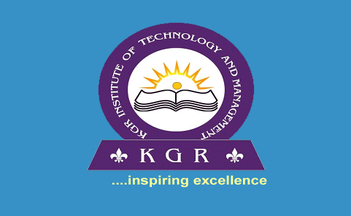 KGR Institute of Technology & Management. Administrator Mobile No: +91 9347470703. Land line: 040 – 20080123. Tele Fax: 040 – 27126831. 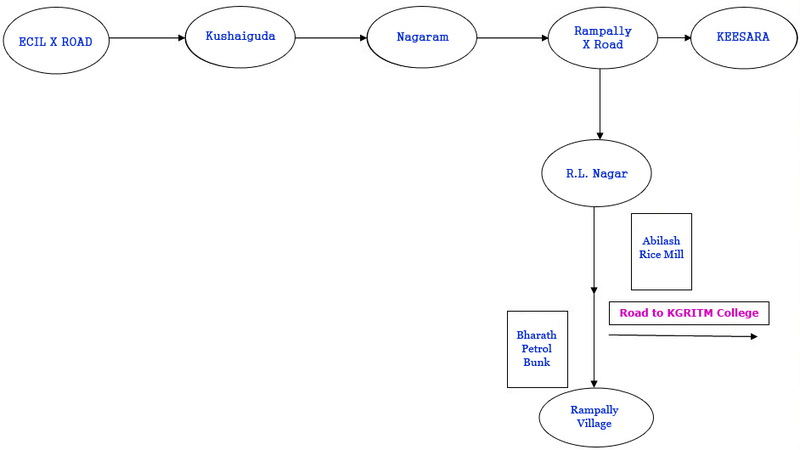 Bus Route: RTC Bus route No. 281 from Secunderabad – ECIL – Ghatkesar are available at every 15 minutes. 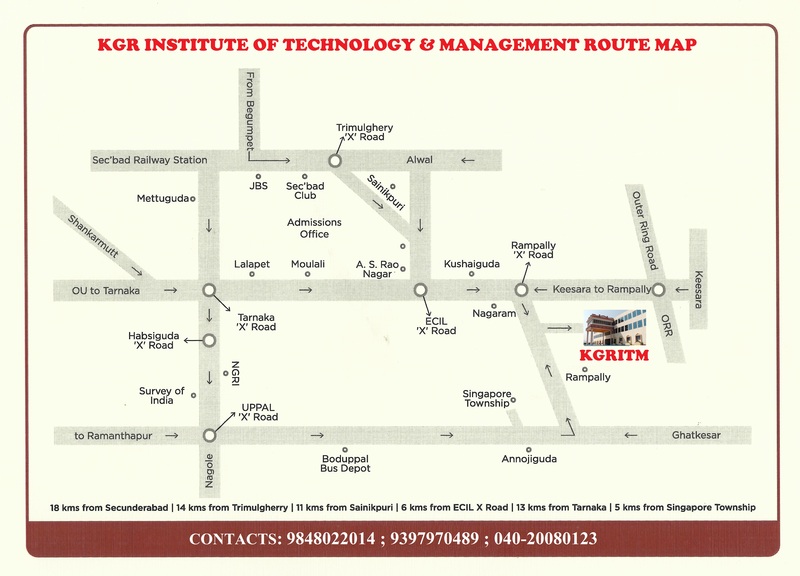 © KGR Institute of Technology & Management - 2013.